Our next major photopost will be of your churches with the Crosses, statues and paintings veiled for Passiontide; please send your photos to photopost@newliturgicalmovement.org for inclusion. Be sure to include the name and location of the church, and always feel free to add any other information you think important. We will follow this up with photoposts of Palm Sunday and the other major ceremonies of Holy Week. Evangelize through beauty! 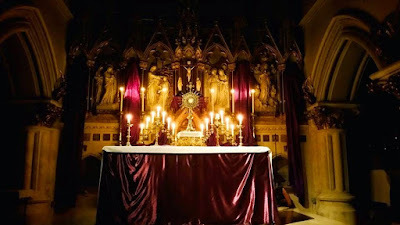 From last year’s Passiontide photopost: Benediction at the Church of St Magdalene in Brighton, England.